Companies plan for months ahead of time for the industry's biggest trade show. In the days after last year’s Consumer Electronics Show in Las Vegas wrapped up, public relations agency Diffusion approached each of its various tech-oriented clients with a question: Will they be returning next year? For companies that opted to slide in their chips, so began nearly a year’s worth of charting product roadmaps, organizing narratives, coordinating previews and press conferences and other preparations that will all culminate over the course of a few days at this week’s massive trade show. When it comes to the tech industry’s single biggest event, the decision to attend can cost a company anywhere from a few hundred thousand dollars to several million, depending on the business’s size and the scope of its planned presence, according to Ristic. 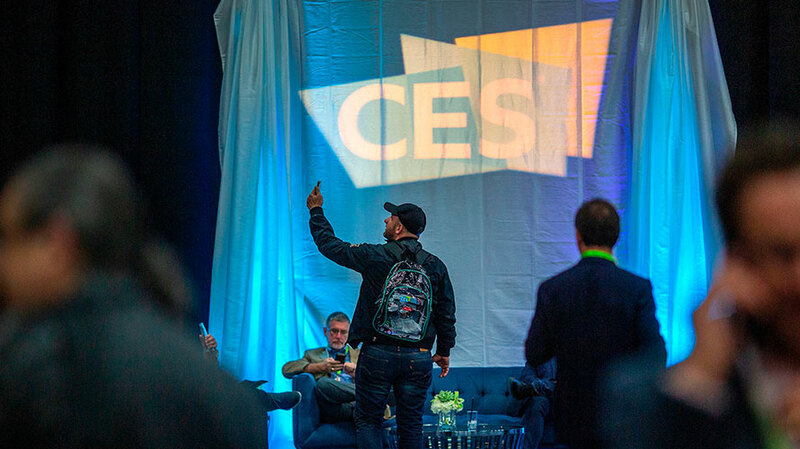 And even with PR and marketing agencies attuned to the ins and outs of CES customs, standing out in a field of nearly 70,000 exhibiting companies that range from small startups to tech giants is no guarantee. There are obvious reasons why companies take such a high-stakes bargain: With more than 180,000 industry professionals in attendance, potential investors, media buzz chances and dealmaking opportunities are plentiful. But some agencies now tell small- to medium-sized clients that unless they are confident they have a truly novel concept that immediately grabs a passerby’s attention, the chances of breaking through the noise as an unknown are relatively slim—even with a booth in high-traffic areas. "Many people underestimate how crazy CES is compared to any other show in terms of getting attention and standing out." In that environment, it can take careful planning and outside-the-box thinking for agencies to ensure that clients get the right people’s attention. Laura MacDonald, head of consumer business in North America for Hotwire PR, said her agency has largely moved away from hosting its own press events for clients in the 10 years she’s been attending CES. Instead, she now relies on participating in joint events between many smaller companies, timing newsworthy announcements ahead of the fray and scheduling meetings strategically with key investors and journalists. Ristic said his agency take advantage of automotive or other transportation clients to book meetings on-the-go with attendees busy traversing the Las Vegas venue’s sprawl. Viral stunts can also help to grab attention—such as the time in 2017 when Diffusion helped enlist a cyclist to bike from New York to Las Vegas ahead of the conference to promote its client company, Electron Wheel, in partnership with Google. Like Diffusion, Hotwire’s planning begins about a year ahead of time as clients take stock of what was accomplished at the previous conference. But the process doesn’t seriously pick up in earnest until the middle of the summer, when the agency sits down with clients to hammer out a strategy towards whatever goal they hope to achieve—whether it be a product release, investor solicitation or media buzz. First contacts are made around August and September, and preview events and more specific pitches begin after that. Ristic said the absolute latest cut-off for a company to spring for a CES booth should be around September or October. Despite all that heavy investment, some startups do manage to have a smaller-scale CES experience with less investment. Marcus Kuchler, CEO and founder of the German startup Udoq, said he will pay between 5,000 and 10,000 euros ($5,700 and $11,400), all told, for a one-man booth to show off his company’s universal charging station device. This will be his company’s first time exhibiting at the show, and he’s hoping to use the appearance to help break into the U.S. market. With the help of his PR firm, he’s set up appointments with a slew of reporters, supply chain buyers and retail groups, and he’s confident that strategy will be enough to make an impression.